Orchid plants need roots! That statement seems so obvious that many of us forget the pivotal role this part of the plant plays. 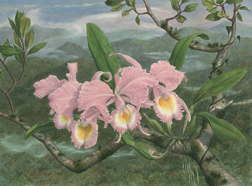 Much of the other aspects of orchid culture, e.g. light intensity, fertilizer, etc, all depend on the mass of tissues we call roots. In nature, most epiphytes, i.e. orchids growing attached to trees, have far more living root tissues than leaves, bulbs, and stems. That ratio of roots to leaves & stems tells us that the plant is limited by either water or nutrients, both of which are taken up by roots. The fact that roots quickly penetrate into the growing medium and around and on the pot of our orchids in culture tells us that they too require these water & nutrients for growth. Over the years, I have visited many commercial and hobby orchid growers and observed all kinds of orchids being grown both poorly and well. The one great surprise is that there is no universal set of cultural techniques used by great growers. One hobbyist claimed that he never or rarely fertilized and grew in very high light. While his orchids’ leaves were yellow green, they were clearly blooming and growing well. Another excellent grower fertilized every time he watered, except for flushing without fertilizer once a month. He too, had beautifully grown plants and excellent flowers. The one difference between the orchids in these two greenhouses was the quantity of roots on orchids from these two growers. Orchids fertilized with every watering had fewer roots than my own plants, while orchids that were never fertilized had at least twice as many. It has always been very easy to move plants into my culture when they had more roots than when they had less. Most orchid hobbyists purchase orchids for the flowers and may casually look at leaves and bulbs. The roots, however, hold the key to growing this orchid after it finishes flowering. An orchid with few roots relative to the weight of leaves will need to spend much of the energy derived from photosynthesis growing roots unless it has constant moisture and nutrients. Satisfying this requirement can be difficult for most hobbyists, especially if the medium in which you grow is coarse, or you grow in high light or heat. It does not matter if there were never roots on the plant or that they were killed by over watering, the effect is the same and the remedy is to grow more roots. Once roots are lost it is very difficult for the hobbyist to get adequate nutrients into the orchid plant since roots are the main route into the plant. Some growers claim great success “foliar feeding” orchids. Most scientific studies have not been able to verify nutrient uptake through this method. The waxy leaf tissues prevent water loss and consequently water gain. The only exceptions are the stomata underneath leaves. These open to admit carbon dioxide and release water vapor for cooling. When roots are lost it is necessary to reduce all factors which tend to remove water from the plant and to encourage new root growth. Withholding water from the plant will encourage new root growth in most hybrids and some species. This must be accompanied by high humidity and lower light to avoid overly desiccating the plant. Vandas and phals, or any member of the vandaceous or angracoid group can be encouraged to grow their few, thick roots by applying one of the commercial root-inducing hormones, usually dissolved in lanolin and sold as a paste. This works extremely well and is well worth the cost to save a few plants. For orchids such as cattleyas, oncidiums, dendrobiums and even paphs, fertilizing with a fertilizer made from seaweed will often stimulate both root growth and multiple new growths. These fertilizers contain auxins, plant hormones in tiny quantities that are enough to initiate new growth. I recently added one of the powdered root-inducing hormones (RooTone) to my fertilizer water to try to stimulate new growth and was rewarded by lots of new roots in the next few weeks. Root growth for some orchid species, though, is almost impossible to initiate except at very specific times in the growth cycle. Some bifoliate cattleya species only put out a very small number of roots and if these are damaged or destroyed, there will be no growth until the following year at the same time. Once roots are lost from these orchids it is necessary to fool the plant into initiating another growth cycle by altering day length and temperature. Do not try this unless you know exactly what conditions are necessary to stimulate root growth. The sun is getting higher on the horizon and unprotected orchids on the windowsill and near the greenhouse glazing can burn. It is easy to tell if your plants are getting too much sunshine by examining leaf pigments. More red color and natural pigmentation is a sign that it is time to add shading.